Forwards Pavel Datsyuk, Evgeni Malkin, Alex Ovechkin and Ilya Kovalchuk are among the 35 players invited to Russia's pre-Olympic hockey camp next month. Forwards Pavel Datsyuk, Evgeni Malkin and Alex Ovechkin are among the 35 players invited to Russia's pre-Olympic hockey camp next month. Goalies Sergei Bobrovsky and Evgeni Nabokov, defencemen Anton Volchenkov and Andrei Markov and forwards Alexander Semin, Vladimir Tarasenko and Nail Yakupov are other NHL players expected to attend the Aug. 23-24 camp in Sochi, Russia, site of the 2014 Winter Games in February. The long-awaited deal for the NHL to send its players to Sochi came Friday, with the league and its players giving the green light for a fifth time. Former New Jersey Devils sniper Ilya Kovalchuk, who retired from the NHL two weeks ago and subsequently signed on with SKA St. Petersburg of Russia’s Kontinental Hockey League, was also invited. 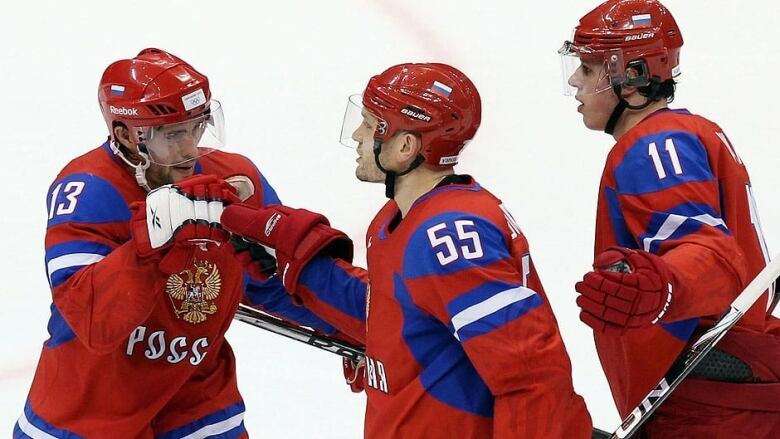 The Olympic tournament runs Aug. 12-23, with Russia’s first Group A game against Slovenia on Aug. 13. Slovakia and the United States are the other Group A teams. Russia and the other squads will be asked to submit a 25-man roster, which is two more skaters than the 2010 Games in Vancouver. Each country can now name 22 skaters and three goaltenders.